7mm Scale Etched Brass kit. Backhead whitemetal casting. All other castings in lost wax brass. 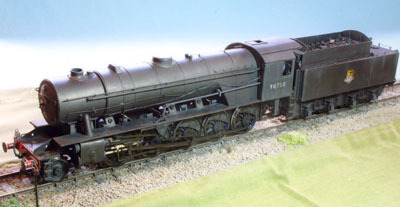 All axles are sprung in etched hornblocks which are also available separately. Recommended motor/gearbox is the ABC VML2 which is only available from them. Slaters wheelsets can be supplied, see options box, as can a Westinghouse air pump for military and overseas locos. 150 2-10-0s were built to the oders of the Ministery of Supply by North British between 1943 and 45. Nearly all served overseas in Europe and the near East. After the war many were returned to the UK and became BR numbers 90750 to 90774. Most worked in the Scottish Region. Two were kept by the Army and ran on the Longmoor Military Railway/ AD600 'Gordon' is preserved.